A true game changer: Interview with Michael A. Tuschak and Dr Wolfgang Bauer, of Mayer & Cie.
Talking Heads is an Knittinindustry.com column, which features interviews with the industry’s movers and shakers. This Talking Heads includes an interview with men behind spinitsystems, Michael A. Tuschak, in charge of marketing and sales of the Mayer & Cie. spinning and knitting machine, and Dr Wolfgang Bauer, head of the company’s development department. During the interview, the industry experts discuss their product, its ITMA success and the Spinit’s future. Mr. Tuschak, could you please describe in brief exactly what lies behind the concept of spinitsystems? Michael A. Tuschak: spinitsystems is a technology that has an out-of-the-ordinary approach. It combines the spinning and the knitting process. Spinning, cleaning and knitting are done by one machine. Knitwear is produced for the first time not from yarn but straight from roving. The rewinding process that used to be necessary is no longer required. That has many advantages. The production process of single jersey knitwear takes much less time. That in turn leads to fewer machines being required. The investment outlay is reduced and space and energy are saved – again quite significantly. Yarn no longer needs to be stocked in such large quantities, there is less waste, and production costs are reduced. Dr Bauer, could you please give us a “historical” outline of the spinitsystems project? Dr Wolfgang Bauer: The basic idea dates back to 2004 when the first patent applications were made. Mayer & Cie. has been involved in combining spinning and knitting since 2004. Quite slowly to begin with, then the idea gained momentum, the team was set up and continually enlarged. I joined it in 2006. Right after I joined we carried out a feasibility study with a 48-system machine, a Relanit 1.6 E. That worked well and our target was then clear: to develop a marketable technology with a system capability. We moved up to 90 systems. That required a new drafting technology. And that was what we were able to exhibit at the 2011 ITMA in Barcelona. In Barcelona we tested the market for feedback. How did people feel about our concept? The feedback was very, very positive. We felt confirmed and continued to develop the technology to make it finally market-ready. We reached that stage in time for the 2015 ITMA. Dr Bauer, what was the most important development progress between the 2011 and the 2015 ITMA? Dr Wolfgang Bauer: For one, it was important to take the drive technology far enough forward to cater for the requirements of spinning and knitting. For another, we developed the Fancy Module over the past year and a half and it was with that module that we achieved our major breakthrough in Milan. What were the highest hurdles you had to surmount? Dr Wolfgang Bauer: We found that we were unable to produce an acceptable material quality without cleaning the raw material. Prior to Barcelona we were already aware that cleaning of the raw material was indispensable. To say that is one thing; to find a good solution for it another matter entirely. We worked flat out on a patented solution of our own. That too was a great step forward between the Barcelona ITMA and the Milan ITMA. What is so special about the machine from your developer’s viewpoint? Dr Wolfgang Bauer: That we succeeded in designing a truly compact machine that is really user-friendly too. The drafting systems are modular in design, which means they can simply be fitted on and removed. That makes the operator’s job much easier. Mr. Tuschak, what is special about the machine for you? Michael A. Tuschak: The compact and at the same time modular design convinced me too. And then the cleaning; it sets us apart from other concepts because we can influence the quality. I naturally have certain framework conditions that are set by the flyer roving, but by cleaning I can define my quality precisely within this framework. Compact? From a distance it looks just like an ordinary knitting machine. Michael A. Tuschak: Yes, we are often told that. The knitter says he knows it all already, at least the lower area. And the spinner says the same about the upper area. Our task is now to make a spin-knitter out of the spinner – and out of the knitter too! The Spinit 3.0 E’s market launch began at ITMA. How was ITMA? Michael A. Tuschak: It was an outstanding experience for me personally as a representative of Mayer & Cie. and as one of the people responsible for the Spinit. We exhibited the Spinit very prominently. We had a separate room for it, due of course to the fact that we needed a spinning mill climate for the machine. The room seemed to attract visitors as if by magic. We made around 600 company contacts within the one trade fair week in Milan, between 80 and 90 per day, or around 10 per hour. They included many potential customers, fully integrated factories, spinning mills and so on. We did our utmost to answer all of the visitors’ questions. I can only say that it was a great, intensive experience! Dr Wolfgang Bauer: ITMA was very, very successful. The visitor numbers surely speak for themselves. The interest shown was enormous. I can only echo what my colleague just said. The visitors and prospective customers came at us thick and fast, so to speak. Did either of you set yourself a specific ITMA target? Michael A. Tuschak: I wanted us to put on a show we could be proud of so that with the technology and our overall Mayer & Cie. trade fair concept looked really good – with the Spinit as the icing on the cake, as it were. From the sales viewpoint it was naturally important to book initial orders. That too worked. We sold at the trade fair several machines we will deliver to the customers in the course of 2016. Dr Wolfgang Bauer: We wanted to present the machine with the Fancy Module technology at ITMA. With it we can vary the fineness of the yarn as per pattern – and do so during the production process. We can use it to produce entirely new patterns of our own. There is no other way in which to knit patterns that way. Does that mean your personal expectations of the ITMA were fulfilled? Michael A. Tuschak: They were more than fulfilled. It was not just that the response was enormous; the quality of discussions was surprisingly good. We could see that prospective customers were looking at the spinning and knitting technology in detail and wondering what benefits it might offer them as potential users. Dr Wolfgang Bauer: Our expectations were over fulfilled. Quite apart from the keen interest that was shown in our Spinit we were able to hold many valuable discussions – and to do so at a level that would have been totally inconceivable four years earlier in Barcelona. We were now able to discuss applications and to deal with potential customers’ special issues. What was the most important feedback you gained from talks with customers? Dr Wolfgang Bauer: The visitors to ITMA come from countries all over the world, they have the most varied range of uses and bring them with them to discuss them with us quite openly. Getting to know this breadth and depth was a most important experience for me. Michael A. Tuschak: The customers came to us because, as they said, we had something really new to see: a game changer. “A true game changer” is what one customer quite spontaneously called our Spinit. He felt that spinitsystems has totally changed the rules of the game. I feel that really is the case; combining spinning and knitting truly is a totally new approach. Spinit has changed the game. Where, on the basis of this feedback, do you see the greatest potential for Spinit? 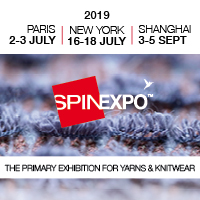 Michael A. Tuschak: We see great potential in the classic textile markets, but consideration is also being given to using Spinit in markets that are no longer the classical ones. We had good talks with customers from the United States, for example. You might think that textile manufacturing is no longer profitable when personnel costs are higher, but there too our approach evidently has potential to change the game. Let us take the United States again. A lot of cotton is produced there. With our new machine the cost of processing the cotton can be reduced for one; for another, entirely different qualities are possible. There is potential for the industry and we sensed that at the trade fair. Dr Wolfgang Bauer: Along with the classical uses of single jersey – t-shirts, shirts, underwear – technical uses have emerged. Spinit material is highly suitable as a carrier material for coatings, for example. Where do you stand right now where the market launch in concerned? Michael A. Tuschak: This year we will be shipping the first machines to our bridgehead markets – markets where we have sought and found the right partners. With them we are starting the rollout, scheduled by region. The machines will be taken into production. We look very intensively into the customer’s business model and project to ensure that the Spinit can be a success story for each and every customer. Dr Wolfgang Bauer: We are looking forward to close collaboration with the customers who take delivery of the first machines. We eagerly await their feedback. And we naturally hope it will include many suggestions as to how we can develop our technology further. That aside, we have our own development targets. One of them is the Fancy technology. In the future we would like to offer our customers further ways of making use of the technology. Michael A. Tuschak: Raw materials are another important issue. We will be going beyond combed cotton, the standard we used to develop our technology. We are looking into other kinds of cotton and synthetic fibres. Together, we and our first customers will be able to arrive at exciting findings. Our aim is to make the technology fit for these other areas of application. Be the first to comment on A true game changer: Interview with Michael A. Tuschak and Dr Wolfgang Bauer, of Mayer & Cie.